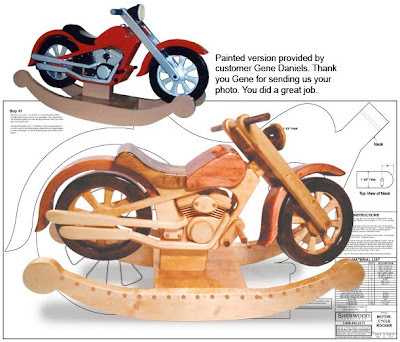 A great heirloom to build for your Child or Grandchild. Easy to follow pattern. This is hog heaven for every rider who has kids! Our exclusive, easy-to-follow pattern features simple tracing, and assembly guides. The wheels really spin, the handle bars turn left and right, and the whole thing rocks back and forth! We guarantee a roarin' good time for all! 29"H x 50”L x 16"D. Parts Req’d: Dowel (2) W-190. Interested in purchasing this woodcraft pattern? Click here!